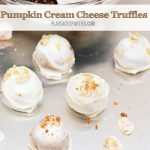 Get your pumpkin spice fix with these two delicious pumpkin truffles recipes: pumpkin gingerbread truffles and pumpkin cream cheese truffles. Are you tired of pumpkin yet? If you are, I’m sorry to say that this post just might put you over the top. Maybe I did a good job avoiding too much pumpkin spice everything this year, because I’m still dreaming of pumpkin pie and other squash based goodies. 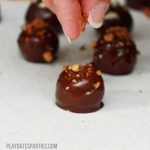 In any case, when I saw a recipe for chocolate pumpkin gingerbread truffles over at BHG, I couldn’t resist making them. And they were pretty tasty. Different, but definitely tasty. They’re not too pumpkiny, either. As a matter of fact, they only use 1/3 of a can of pumpkin. I wasn’t about to waste the remaining canned pumpkin, so I went in search of another recipe. That’s when I found pumpkin cream cheese truffles at Gimme Some Oven. Oh, are they good! I couldn’t put them down. As a matter of fact, I couldn’t put either of them down. And that’s how I ended up with this double whammy of a pumpkin post. Of course, I put my own little twist on each of them. Dip the balls in batches. If possible, keep all the rolled filling balls in the freezer, puling out no more than 10 at a time to dip. If your freezer is too small (or too full) to hold a whole tray of truffles, rotate two plates of truffles, 10 at a time, making sure that the truffles are frozen for at least 15 minutes before removing. Use two toothpicks. One to hold the truffle while dipping and then another to gently loosen the dipped truffle onto the fresh parchment paper. Using a small spoon (baby spoons work great for this), and working quickly, add a bit more chocolate on top of the toothpick hole and smooth out. 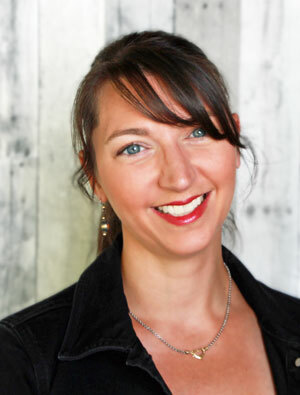 Now on to the recipes…first up, chocolate of course! 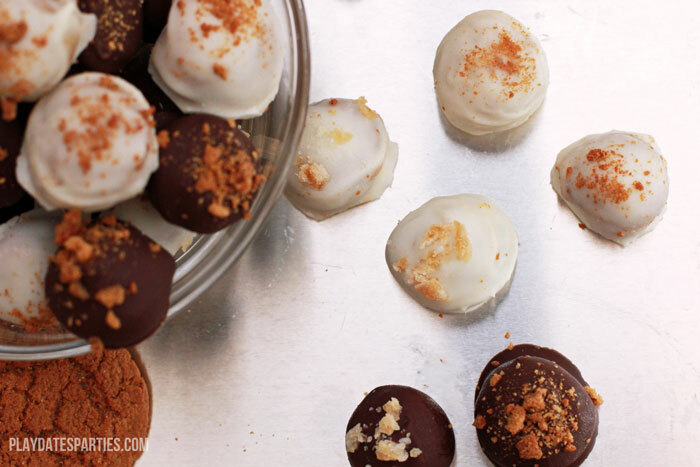 These truffles are a far cry from boring! Chocolate pumpkin gingerbread truffles smooth and creamy, with just a hint of pumpkin and a surprising kick from gingersnaps and candied ginger pieces. In a small bowl combine bittersweet chocolate and semisweet chocolate. Separate 1/2 cup for the filling and set the remaining chocolate aside for the shell. Roll into small balls, using about 1 rounded teaspoon for each (yields about 30 balls). Freeze for 15 minutes. While the balls firm in the freezer, line a baking sheet with parchment paper and set aside. Using a double boiler cook and stir the remaining chocolate over medium-low heat until melted and smooth. 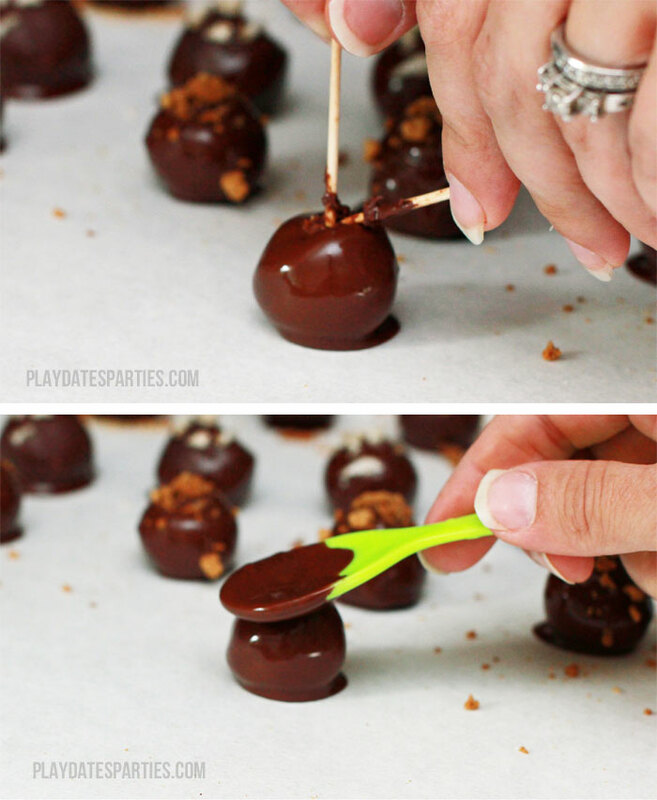 Using a toothpick, dip frozen balls, one at a time, into melted chocolate and place on the prepared baking sheet. Garnish with crushed gingersnaps or chopped candied ginger. Return to refrigerator until firm, about 1 hour. 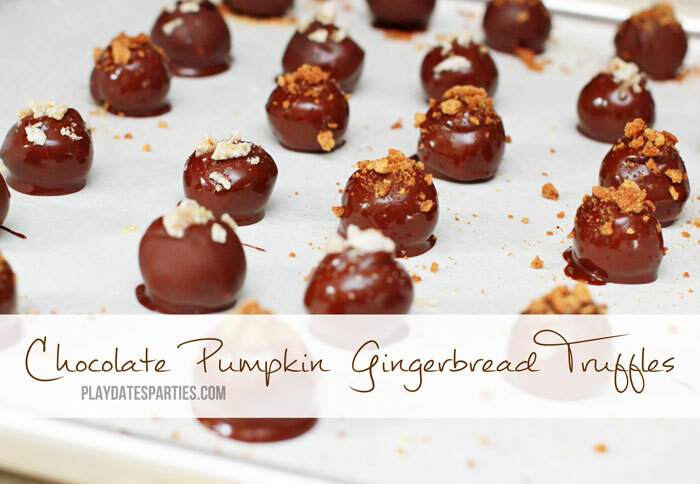 Now, if you’re not all that into the spice combinations in the pumpkin gingerbread truffles, then you might want to give pumpkin cream cheese truffles a try. They’re sweet and completely addictive, with a much more pronounced pumpkin flavor. 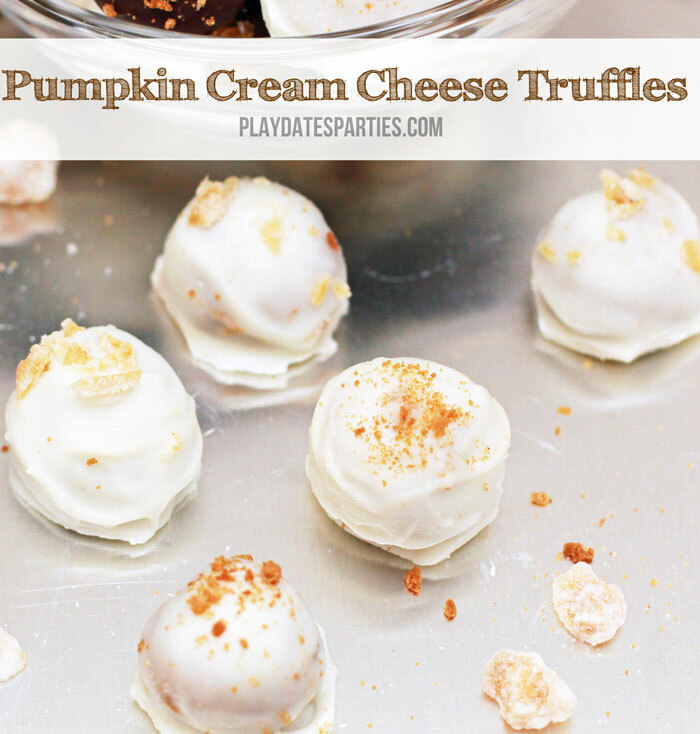 If you love pumpkin, these pumpkin cream cheese truffles are your new favorite treat! Best of all they are as addictive as they are easy. 14 oz white chocolate or vanilla almond bark. Combine the pumpkin puree, crushed gingersnaps, powdered sugar, cinnamon, ginger, nutmeg, cloves, salt and cream cheese in a stand mixer fitted with a paddle attachment. Mix until combined and smooth. Chill mixture until mostly hardened. Using a teaspoon or melon ball scoop, shape mixture into balls and set on a baking sheet prepared with a sheet of parchment paper. Freeze until solid, approximately 2 hours. Meanwhile, combine white chocolate and shortening in a double boiler and melt until smooth. Prepare a second cookie sheet with another sheet of parchment paper. Before the chocolate sets, sprinkle with crushed gingersnaps or chpped candied ginger. Return to refrigerator until firm, about 1 hour. Tips for dipping truffles: Dip the balls in batches. If possible, keep all the rolled filling balls in the freezer, puling out no more than 10 at a time to dip. If your freezer is too small (or too full) to hold a whole tray of truffles, rotate two plates of truffles, 10 at a time, making sure that the truffles are frozen for at least 15 minutes before removing. Use two toothpicks. One to hold the truffle while dipping and then another to gently loosen the dipped truffle onto the fresh parchment paper. Using a small spoon (baby spoons work great for this), and working quickly, add a bit more chocolate on top of the toothpick hole and smooth out. What’s your favorite way to serve pumpkin? Have you had enough of pumpkin recipes yet? Oh my goodness, these sound (and look!) amazing! I love pumpkin and gingerbread so I can only imagine how good they would be together. 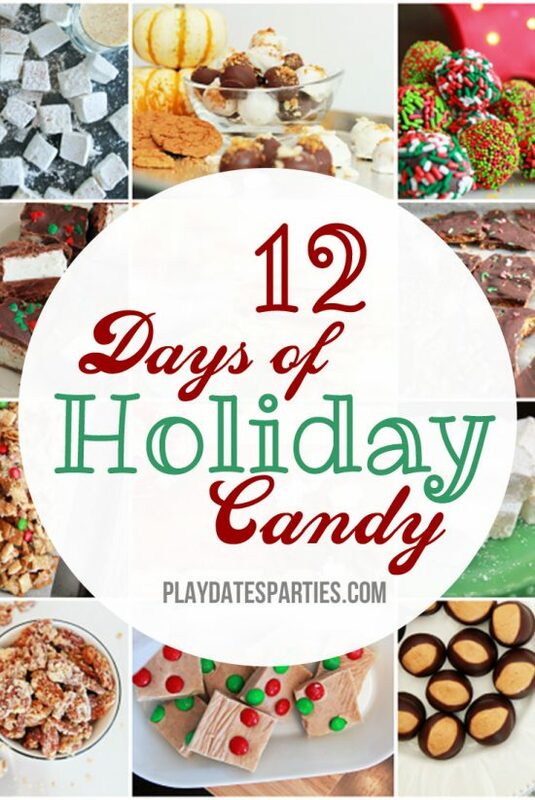 Definitely trying these this holiday season. Thanks so much for linking up with us at the Maker’s Mix-Up link-up this week! If I ever get ambition and fancy- these are happening! These sound so delicious! 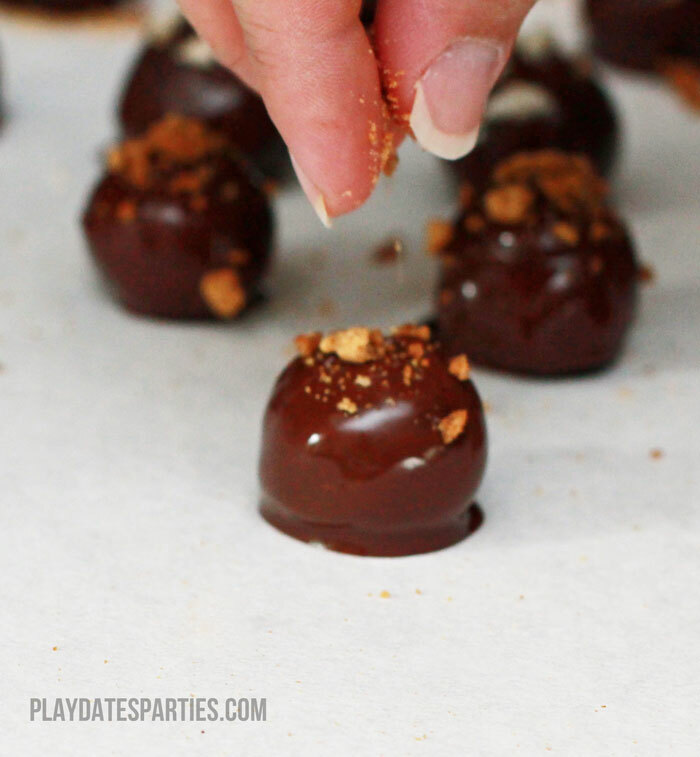 I will definitely have to make these sometime – truffles are my fav! 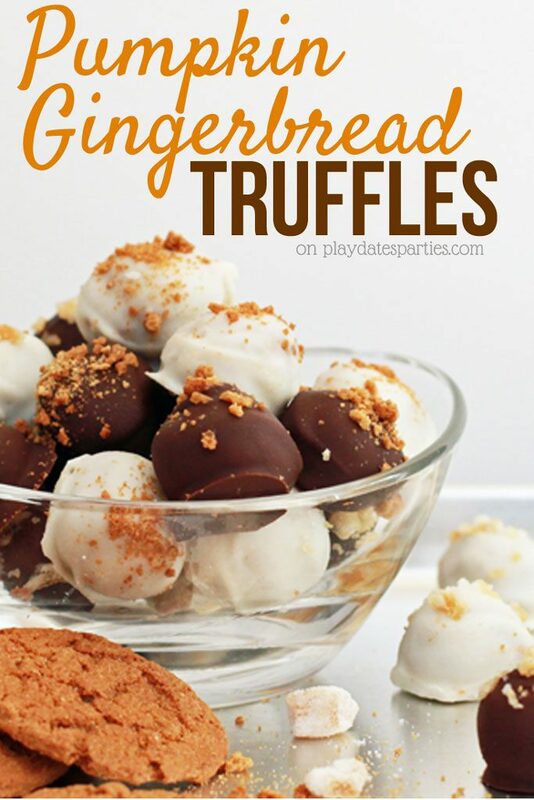 I always thought truffles were waaay out of my league, but these look doable. I am not sure they will turn out that pretty, but I would like to try and make them, because I have a very intense love affair with all things pumpkin!